Fear of injury keeps many people from riding a bike. Safety is a legitimate concern, but one that can be mitigated with a few helpful tips. By operating your bike according to the basic principles of traffic, motorists can see you more easily and accommodate you. Communicate with drivers and signal your intentions using hand signals. Don’t ride on the sidewalk (it’s illegal in Chicago if you’re 12 years or older). Ride with confidence and know when to “take the lane.” Always scan over your shoulder and signal before moving to the center of the lane. Wear bright/reflective clothing and use appropriate lighting and reflectors at night to maximize your visibility. It’s the law. Consider taking a traffic safety class for bicyclists. Find a riding companion—someone whose experience can be helpful. Visit Pace Ride Share at www.pacerideshare.com to find other bike commuters in the Chicago area! Think of a helmet the same way you think of a seat belt. It won’t prevent a crash, but it could save your life if you’re ever in one. One study published in the Journal of the American Medical Association found that cyclists wearing helmets in a crash have a 69 percent reduction in their risk of head injury and a 75 percent reduction in their risk of brain injury. If the helmet does not cover the top half of your forehead and seems to sit on top of your head, then it’s too small. If there’s a gap between the rim of the helmet and your head or it wobbles on your head, it’s too large. Eyes: Adjust the helmet so that it sits level and the rim of the helmet (not the sun visor) is just in your field of vision when looking up. There should be about two fingers width between your eyebrows and the rim of the helmet. Ears: Adjust the buckles on the side straps so that they form a “Y” with the junction directly below the earlobes. 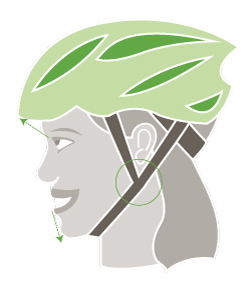 Mouth: The straps should be buckled under the chin and the tension should be adjusted so that you can feel the helmet pull down when the mouth is opened wide. Transit fare or cash in case you have a mechanical breakdown and need to jump on the bus or train, or catch a cab. Identification and emergency contact information (keep emergency phone numbers listed under ICE—In Case of Emergency—on your cell phone). Print out our Everyday Biking Guide.